Moving Truck Accidents | Nashville Trucking injury Lawyers The Law Offices of John Day, P.C. We see them every day—moving trucks or moving trailers rented to help ordinary people get from one home to the next. While most of us have probably rented one of the these trailers before, we may not have realized how dangerous they can be. 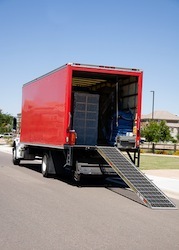 The trucks and trailers rented by national and regional moving companies do not operate like a standard car or truck. Limited rear visibility, decreased speed capacity, decreased maneuverability, increased braking time, considerations of weight and load distribution—these are just a few of the special considerations a driver must take into account when operating one of these moving vehicles. However, trucks and trailers are rented each day to people with absolutely no training on how to drive them. The rental company often provides no special instruction at all before allowing a driver to leave with a trailer attached to his vehicle. Even if the renter is given a manual or instruction book, there is no requirement that he or she actually reads it. Largely due to inexperienced drivers, moving trucks and trailers are involved in countless accidents each year. If you have been injured by a moving truck or trailer, one of our award-winning lawyers can help you get the compensation you deserve. From identifying all of the at-fault parties to ensuring that the insurance company does not undervalue your claim, a proven legal team will help you successfully navigate the complex litigation system. Contact us today for a free, no-obligation consultation. We handle all accident cases on a contingency basis so we only get paid if we recover money for you. And unlike some lawyers, we advance all case expenses so you do not have to pay any money out of pocket to pursue your rights. To learn more about our fees and how we handle expenses, click here and then call us at 615-742-4880 or toll-free at 866.812.8787 or you can contact us online if you prefer.